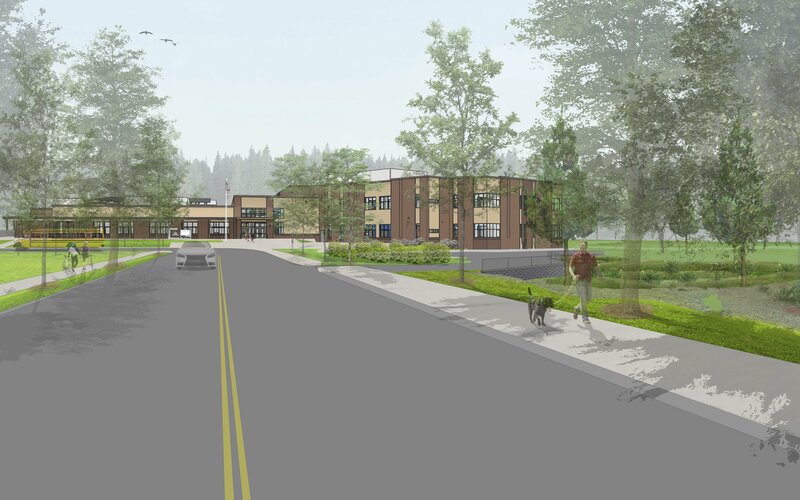 When the new Sunset Primary School in Portland, Oregon was designed, it was done so to maintain the nostalgia of its 1917 beginnings. But, as is required with all schools today, the safety and security of the students and staff was the top priority. With active shooter scenarios becoming a regular occurrence in schools, architects and construction companies must consider how to keep the children safe when a potential threat arises. Contractor Triplett Wellman Construction partnered with American Direct to provide exactly what the school needed to ensure a safe and secure environment for Sunset students. Specifications called for the BEST SHELTER SYSTEM. Because every school building is different, SHELTER was designed to adapt to an individual school’s layout, traffic flow, and security protocol. In a live shooter or violent incident, it’s critical to be able to quickly create safe spaces within the interior of a building: classrooms, offices, assembly areas, multi-purpose rooms, corridors. SHELTER allows administration to respond rapidly to safeguard students, employees, customers and visitors. SHELTER is a unique combination of code-compliant mechanical hardware and proven technologies — a responsive lockdown solution that can be configured to adapt to the building and security protocol. SHELTER has the ability to connect to an alarm panel to notify first responders and lock down a single door, a set of doors or an entire building of doors. Best of all, it was designed with input from people who have experienced live lockdown situations. American Direct Northwest Regional Sales Manager, Tony Mendenhall, reviewed the pre-designed specifications from the architects and confirmed that the suggested BEST product would meet the needs and restrictions of the school access control system. Mendenhall also served as a liaison between Triplett Wellman, BEST, and the school district, providing the necessary training to school faculty who would carry, or have access to, a SHELTER fob. With assistance from the school’s integration resource, the SHELTER network components were configured so the fob initiates a signal to the pre-installed access control system or alarm system, allowing communication with first responders. Acting as a liaison between the general contractor, the supplier, and the end user is one of the pre-construction services American Direct provides to help manage quality, schedule, and cost throughout the life of a project. Plus, American Direct’s expertise in Division 8 and Division 28 product and service is invaluable in ensuring all pieces of the safety and security puzzle fit together properly. “With hollow metal doors and frames, it takes a lot of time to get the jamb depth and openings just right. American Direct is very good about identifying that,” says Hall. The unfortunate reality of today is that schools must be lockdown ready at a moment’s notice. But, there is some comfort knowing that with excellent security products such as BEST SHELTER system coupled with the expertise of American Direct, the parents and faculty of Sunset Primary can rest assured their children are safe and secure. Lockdown is initiated via individual fobs or panic buttons/ switches that are connected to repeaters in the building. Fobs can be configured to a single lock, a group, or the entire facility. Visual indicators and a configurable audible alarm help communicate lockdown status (per lock) throughout the building.